and Three Hours Behind (EASTERN STANDARD TIME). 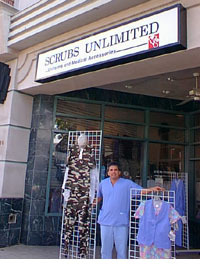 Scrubs Unlimited would love to bring its wares to your Los Angeles-area hospital, clinic, or school! Just email us or call (310) 208-7669 to let us know about you and your group. We'll bring a colorful display of scrubs, shoes, and other accessories by for you and all of your colleagues to peruse, try on, and purchase. Exit off of Interstate 405 at Wilshire Boulevard eastbound. 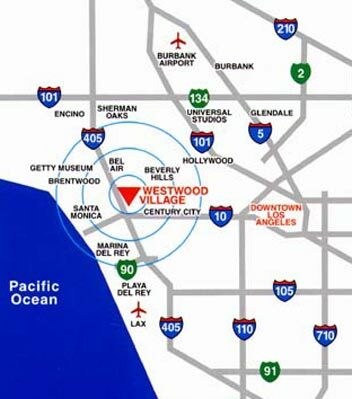 At Westwood Boulevard, take a left. You'll pass two lights, and the third is Weyburn, where you'll take a left. Scrubs Unlimited will be on your left halfway down the block.